This entry was posted on January 2, 2015 by Jessica Anderson. We love all of our customers, but some repeat customers that we help on an ongoing basis become extra special to us. We get to know them well, which creates a meaningful relationship. This award honors such a customer! Congrats to our Customer of the Year! 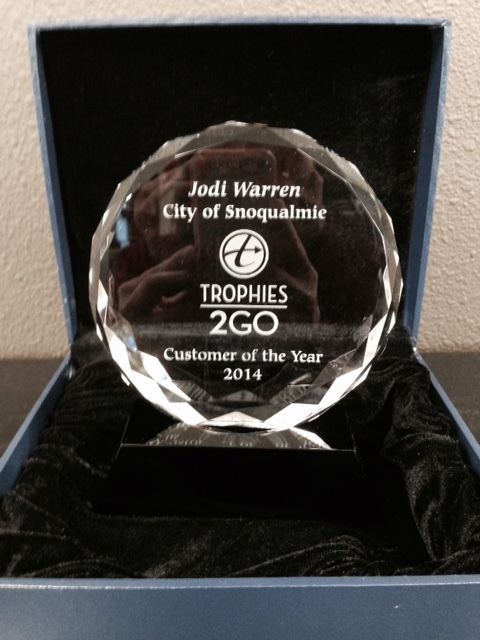 The Trophies2Go 2014 "Customer of the Year" Award goes to Jodi Warren at the City of Snoqualmie. Jodi was nominated by Margene on our customer service team, but all of our staff agrees that she is deserving of this outstanding award! Jodi is THE ideal customer. Qualities used to describe her include sweet, understanding, and flexible. Our staff loves working with Jodi and the City of Snoqualmie, WA to recognize excellence within their organization! Congrats Jodi and thank you customers for making our day. We love working with you to deliver kudos throughout your organization!